Family history isn’t just your grandma’s hobby. Learning about family history brings generations closer together and connects your loved ones through stories. And that’s just one of the 5 reasons why you should attend the RootsTech Family History Conference. If you’re ready to learn the secrets of happy families, come join me and thousands of other family history lovers at RootsTech next month. You’ll be inspired and learn practical ways to include family history in your daily life. In fact, award-winning author Bruce Feiler will be at RootsTech sharing his findings about the positive impact of family stories on happiness. In search of common themes and traditions that make families stronger, Feiler embarked on a three-year journey to find the smartest ideas, cutting-edge research, and novel solutions to make his own family happier. What he found was one part remarkable and one part common sense: talk to each other! Feiler’s discoveries sparked renewed national (and international) interest in family history, from millennial moms to the greatest generation grandparents. By using storytelling as a catalyst, more families began learning about their shared history. Learn how to use tools that help you make family history more accessible and fun. One of the many benefits of attending RootsTech is learning how to use tools like Ancestry.com, FamilySearch, MyHeritage and FindMyPast. All of the big players in the family history industry will be on-hand to talk you through their technology. If you’ve been waiting to get started with a family history project, now’s your chance to meet one-on-one with experts who can kickstart your progress! Many offer demos and hands-on instruction throughout the conference. Discover wonderful products that make family history projects come to life! It’s not just the big players like Ancestry.com who exhibit at RootsTech. You’ll also find incredible, innovative products and services like Legacy Republic and StoryWorth that help you digitize your analog memories and collect stories from family members. Network with fellow family history lovers. In addition to meeting big players and new innovators in the family history industry, attending RootsTech will also give you an opportunity to meet others who are passionate about family stories. If you’re just getting started in family history and want to learn from experienced researchers, genealogists and historians, RootsTech is the perfect venue to befriend them and learn from them. Here’s just a small selection of classes available to attendees: Getting Started in Family History. Salt Lake City is super fun! With the cultural opportunities and awesome restaurants you’d find in big cities like New York or Chicago, Salt Lake City balances cosmopolitan actives with historic mountain-town charm. Last year when we attended, some of the things we enjoyed most were walking around Temple Square, venturing into the downtown public library and eating some of the best Mexican food we’ve ever had at the Red Iguana! 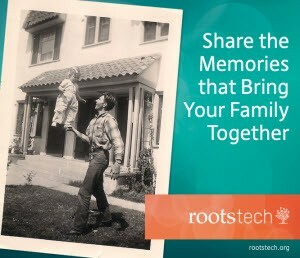 I hope to meet you next month in Salt Lake City at RootsTech, the largest family history gathering in the world! When you make your plans to attend, please be sure to shoot me an email or a DM on Instagram so we can connect in person. I can’t wait to meet you and hear some of your family stories!